On 25 March 1919 an outbreak of fire was discovered in what was known as the drying chamber in the establishment of Messrs Booth and Foxes, Feather Merchants – a premises, which spanned Lavitt’s Quay and Emmett Place. The discovery was made by an employee of the firm who was engaged with others on the premises at the time, and he immediately gave the alarm. All the “hands” then set themselves the task of fighting the fire, and the Fire Brigade at Sullivan’s Quay station were telephoned for from Cork Opera House. The staff of the Opera House led by Mr Pitt, the manager, formed into a willing band of helpers. Water was poured on the burning chamber, in which was stored a quantity of jute – a very flammable material. This work executed by the combined staffs of Messrs Booth and Fox and the Cork Opera House under the able guidance of Captain Hudson of the Fire Brigade, who chanced to be on the scene when the alarm was given, limited the damage from the outset. Founded in 1825, Messrs Booth & Fox was one of the oldest businesses in the City being founded by John Peter booth and John Fox. The original Booth and Fox acquired their first site in much the same position as the 1919 factory occupied. 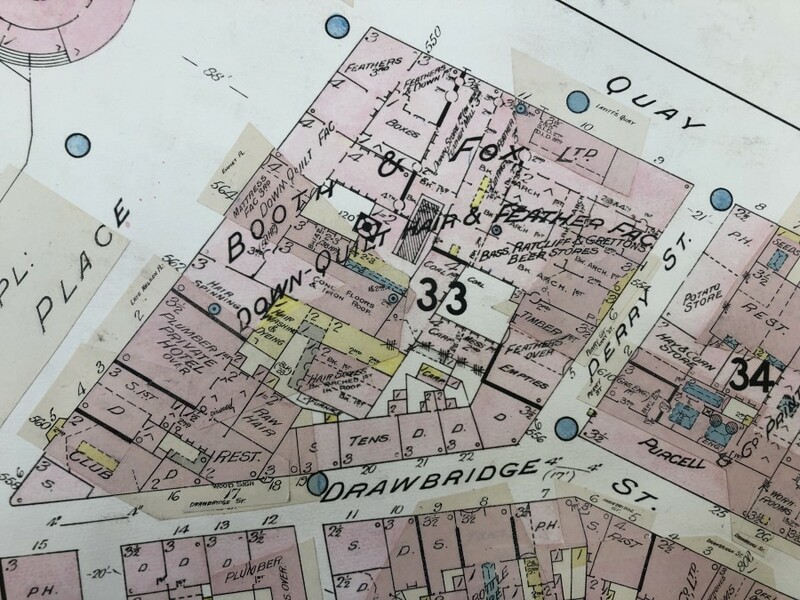 Within a comparatively short span of years they became owners of practically the entire block of the property, which is today bounded by Emmett Place, Lavitt’s Quay, Perry Street and including the private dwellings onto Drawbridge Street. When the company began operation, it was chiefly interested in the collection and manual grading of feathers. The manufacture of down quilts and bedding generally came later. The down quilt was patented by the firm in 1841. In 1867 a royal patent was received for the processing of horse hair and similar material. Horsehair and like materials had been used for stuffing couches and cushions. Booth and Fox’s first sewing machines were very large and three men were required to operate each one – the motive power being supplied by a belt drive. Messrs Booth and Fox were able to command a world market for their goods manufactured in Cork. Agencies were established in South Africa (Cape Town), Australia (Sydney and Melbourne). South America (Buenos Aires) as well as nearer home – Dublin, Belfast and Glasgow, while another factory was started by the firm in Manchester. An account in 1892 by publishers Stratten and Stratten called Dublin, Cork and South of Ireland: A Literary, Commercial, and Social Review described an extensive operation. 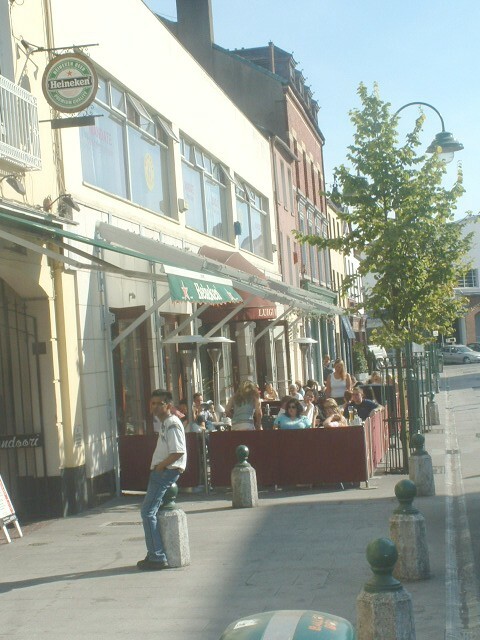 The premises in Cork comprised a very fine and spacious block of buildings of varying elevations and comprised one of the most prominent architectural features of the City. Apart from its well-designed exterior, the works were equipped with no expense being spared to bring the establishment up to the highest possible standard of efficiency. Three hundred people were employed in the various departments and during the busiest season of the year, the number of employees increased. In the Stratten and Stratten publication, the special feature of the firm’s operations was the manufacture of eider-down quilts. They were known for their “economy, lightness, warmth, durability, beauty, and purity” and were said to be unrivalled in the market. Messrs Booth & Fox were also extensive manufacturers of Victorian ladies’ down underskirts, the advantages of which mainly consisted in the fact that they respectively weighed from 18 to 24 ounces. They were as soft as cushions and could be washed with the “down inside as readily as a quilt”. The firm’s successes at the various international Exhibitions in the latter half of the nineteenth century indicated the superiority of their goods over rival houses – from the great London Exhibition in 1862 to Dublin in 1865, Cork in 1883, Melbourne in 1881 and Dublin in 1882. In 1892, the firm had a very large and influential connection in all parts of the world. At 81, Hatton Garden (London), and Piccadilly (Manchester) Messrs Booth & Fox had extensive branch establishments. The managing director who oversaw the rebuilding after the fire in March in 1919 was Mr Herbert Charles Fox. He was born in Monkstown, County Cork in 1875 and was the son of Mr John T Fox, one of the founders of the firm. For many years Henry travelled the world as a representative of the firm and his business acumen ensured that Cork manufactured down quilts reached many corners of the globe. In 1922, when the British Government placed a control on Irish products, he was quick to devise a method of overcoming the restriction when he established what is now a flourishing factory outside London. Henry was also a most popular figure in the yachting world in which he had long experience. He cruised and raced in Cork Harbour as well as all round Britain and Ireland. After the March 1919 fire, the damaged part of the building was re-constructed and was put up according to the most modern specification. All the machinery was completely automatic, the wiring was all fire proof. In August. 1949, the old factory which took in a portion of Emmett Place and Lavitt’s Quay was destroyed in large part by another fire and reconstructed and opened with eighty staff. A third fire also took place on 23 October 1956, which also caused thousands of pounds worth of damage. The building was put on sale in 1961 with the company continuing for at least another decade and half at another City location (any info give me an email). Sunday 7 April, The City Workhouse, historical walking tour with Kieran; meet just inside the gates of St Finbarr’s Hospital, Douglas Road, 2.30pm (free, duration: two hours, on site tour). Sunday 14 April, Stories from Cork Docklands, historical walking tour with Cllr Kieran McCarthy, meet at Kennedy Park, Victoria Road 2.30pm (free, duration, two hours, finishes nearby). 990a. 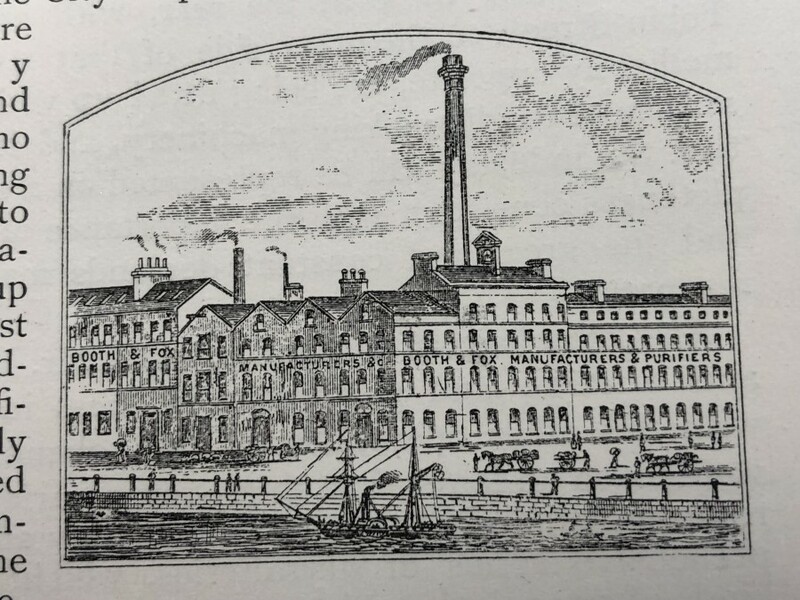 Booth and Fox, Lavitt’s Quay 1892 from Stratten and Stratten’s Commercial Directory of the South of Ireland (source: Cork City Library).